Argentina’s nubile president Cristina Kirchner says she ‘was born wearing makeup’ however, vanity is hardly Ms. Kirchner’s only sin. The veracity of her finance minister’s reported GDP growth rate is questioned by everyone including the all important IMF. 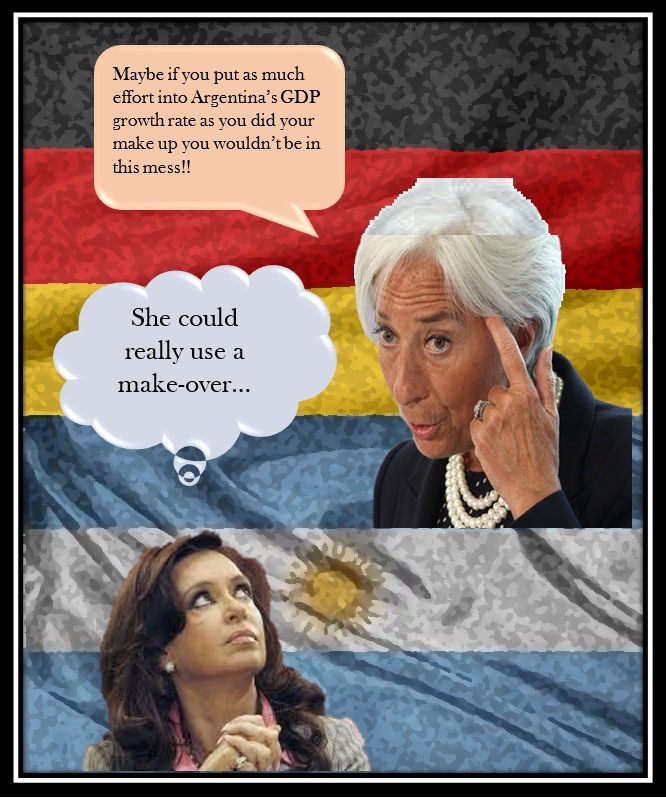 In fact, IMF head Christine Lagarde (an alluring woman for her age as well) has given Ms. Kirchner an ultimatum. She must produce accurate economic figures or the fund will terminate Argentina’s borrowing capacity. The reason Ms. Lagarde has recently become adamant about the accuracy of these numbers is because when Argentina restructured its debt in 2005 (failed to pay back delinquent loans) the country had to sweeten the deal for creditors who took a huge haircut in the transaction, and did so with what are called GDP-indexed warrants exercisable if GDP growth exceeds base level by a certain percentage. When Ms. Kirchner’s late finance minister announced a robust 5.16% growth rate (to increase popularity of Ms. Kirchner among voters) his figure exceeded the threshold making the warrants exercisable. If not corrected, this would mean Argentina owes billions of dollars to creditors which would immediately drag on their actual (and limited) GDP growth. With inflation at 55%, Argentina desperately needs economic assistance from the IMF. Ms. Kirchner would do well to concern herself less with makeup and more with the people she claims to help.